Berlin Embroidery: A New Look – and a Discount! Tanja Berlin, a well-known and well-travelled embroidery designer and instructor living in Canada, has recently revamped her needlework website, Berlin Embroidery, and it is rife with all kinds of treats for the embroiderer! My first contact with Tanja and her website was some fifteenish years ago, when she became my go-to source for goldwork threads, which were practically impossible to find in North America at that time. But Tanja had (and still has!) a magnificent selection of them available, along with goldwork kits and instruction. I’ve been a regular hoverer at Berlin Embroidery ever since. Since first finding Tanja way back when, I’ve also had the pleasure of meeting her in person at an EGA event. She’s a lot of fun, very frank and friendly, and I had a great time getting to know her a bit. So let’s browse some of the highlights of Tanja’s new site, so that you can take advantage of all she has to offer the needlework world. I’ll also share a discount code that Tanja set up for Needle ‘n Thread readers, to celebrate the launch of her new look. Tanja’s new website is predominantly a shop where she sells her own embroidery designs in kit form and embroidery supplies. She features a massive range of embroidery techniques coming from one designer! When you look at the vast collection of designs Tanja has produced over the years, it’s pretty darned inspiring! I’ve stitched several of Tanja’s designs, and what impresses me most about them – and one thing that I’ve taken away for my own approach to producing projects (thanks, Tanja!) – is that her instructions are incredibly thorough. She takes the stitcher from the foundations of embroidery all the way through the finished project in the instructional booklets that come with her kits. So whether you are a beginner who happens upon one of her designs and says, “Gosh, I wish I could do that,” or an experienced embroiderer, Tanja’s instructions will lead you competently and successfully through the project. While her designs vary in levels of skill, some being more suitable for beginners and some for intermediate or advanced stitchers, a really determined beginner will find that her instruction is so thorough that even the more advanced designs are within the realm of possibility. Tanja also offers email correspondence with the purchase of her kits, in case you do hit a snag. 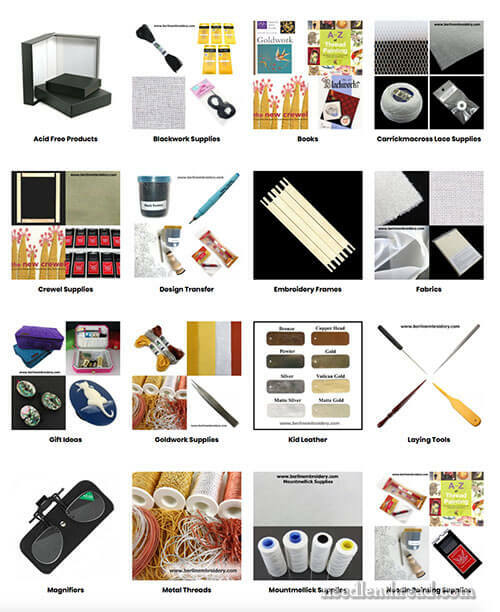 In addition to kits, you’ll find all kinds of needlework supplies available at Berlin Embroidery. Many of the supplies fall into the “more difficult to find these days” category. For example, the range of real metal threads for goldwork and metal thread embroidery that Tanja stocks is fantastic! And with the sad demise of Hedgehog Handworks in the US, Berlin Embroidery is now the only supplier of such an extensive range of goldwork threads in North America. Perhaps the best thing about purchasing goldwork threads through Tanja, aside from the sheer quantity she supplies, is that she knows all about them and she knows all about goldwork. If you have questions, she can answer them, and you can be confident that you’re getting what you need for what you want to do. Tanja also carries Mountmellic threads and fabric, a wide array of tools, including specialty tools, fabrics, some excellent choices in threads, design transfer supplies (stuff for prick-and-pounce among them), a great range of good-quality needles, and all kinds of other little bits and bobs. But Berlin Embroidery is not merely a kit and supply shop. Under Services, you’ll find a bunch of Really Good needlework information! 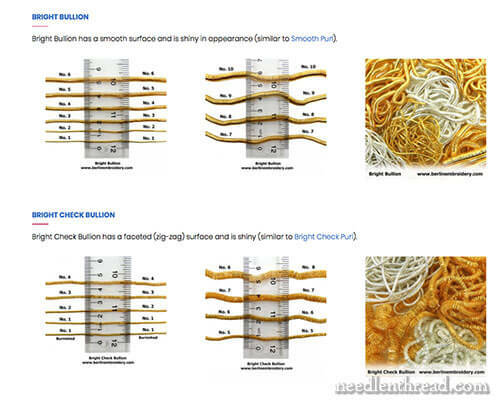 You’ll find sections on embroidery tips, you’ll find a fantastic information page on metal threads, with clear photos of the different types of real metal threads (with size comparisons) and explanations on how they’re used. The metal thread information here is definitely worth book-marking if you have an interest in learning or pursuing goldwork. It’s a gold mine (heh heh). Yay! Tanja has started writing a blog. Now, this is big news, especially because I know Tanja doesn’t really love the whole blogging process. But she’s doing it anyway, good for her! And it makes good reading! Besides keeping up with what’s new on her website and her needlework pursuits, she also provides class information, and covers a bit of personal stuff, too… for example, I have no doubt we will meet her dogs now and then, and we might even catch a glimpse of her husband Russ, too! You can add Tanja’s blog to your feedreader, which is a handy way of keeping up with favorite needlework online haunts. To really enjoy the scope of Berlin Embroidery, take some time to explore the whole website. There’s a glorious amount of embroidery resources there, from a designer who really knows her stuff. Set aside a bit of relaxing browsing time, pour yourself a cup of coffee, and just plunge right on in! To celebrate the new website launch, Tanja has extended a 10% discount to Needle ‘n Thread readers, available now through October 27th. To get the 10% discount, enter this code during the check-out process: needlenthreaddiscount10% – it’s good for everything except shipping and taxes. Tanja is located in Canada, so if you’re in the US, shipping does cost slightly more, but right now, the currency conversion easily covers the difference in shipping costs. 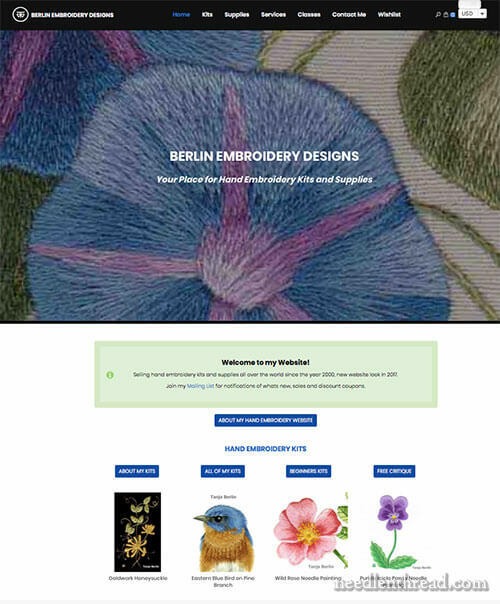 I hope you enjoy browsing Berlin Embroidery’s new website, and that you find some good little morsels to keep your needlework creativity juices flowing! I have taken online classes with Tanya and also ordered kits and supplies from her. The online class was just the best ever!!! And her supplies are reasonably priced and of great quality. After you, she is just one of my favorite online embroidery sources. I love the look of her new website and look forward to returning there often. I did order some kits and a few more tools today, so thank you (and Tanya) for the discount. Hope you are enjoying some wonderful fall weather in Kansas. I was so lucky to attend one of Tanja’s classes when she was on tour sponsored by the Embroidery Guild of America Mid-Atlantic Region. Despite some jet lag from a trans-Atlantic flight the day before, I traveled 100 miles to New Jersey to attend her class on gold work and I’m so glad I did! As you said above, she is a skilled, down-to-earth teacher; and she is very sharp! Her mastery of her craft and background knowledge are vast and deep. I would encourage anyone who has an opportunity to attend one or more of her classes. Thank you for your blog, Mary; I read it all the time! I had a look at Tanja’s site the other day and the new website is really great. It’s easy to use and look at the various items in her shop. She definitely has a variety of lovely embroidery goods to buy and great news for the discount. Thanks for sharing with us the news of Tanja’s new website and for the discount and links to her site. I’ve often bought goods from her which do not disappoint. I hope you have a great weekend of stitching. Thank you Mary! I’ve always wanted to try metal threads and ordered her pendant kit. I can’t wait to get started on it. Could have used this discount about 2 weeks ago 🙂 I ordered from her and as I am in the US it said to allow 2 to 3 weeks for delivery. I received my order within 1 week and the kit was even more gorgeous then described. I am a regular browser of Tanja website and I love her work. Last year I did an on line class with Tanja, her instructions are so clear, easy to follow and her feedback throughout the class wonderful. I was very pleased with my completed project. I have just received her kit for the 4 shaded blackwork cats. Her designs are definitely awesome, as is the new look site. Congratulations to Tanja on her lovely new website! What would we do without her? Over many years, I’ve stitched her kits, bought lots of goldwork supplies, and had the pleasure of taking a class with her. She’s a terrific teacher and I think her kit instructions are absolutely the best. I’m so glad to have rediscovered your site. I am now practically glued to my iPad. Just read your article on Tanja Berlin and was thrilled to know you two have met. I took a gold work class with Tanja a few years ago and met her about 15 years ago at our embroidery guild in Vancouver. What a fine teacher and beautiful stitcher. Anyway, I finally finished my gold work project, grandchildren got in the way, and entered it into our fall fair. Very pleased to say it won first prize! Thank you so much for all the work you do.